Algoma municipalities are being asked to stub out all motions proposed by tobacco companies or front groups that slip demands for a freeze on excise taxes into campaigns against contraband tobacco. Greater Sudbury has the dubious distinction of being named in a secret Big Tobacco document aimed, ostensibly, at fighting contraband smokes, but at the same time quietly lobbying to freeze the excise tax on legitimate tobacco products. Algoma Board of Health, the governing body of Algoma Public Health, is warning area politicians about new evidence linking Imperial Tobacco Canada Ltd. to lobbying campaigns against contraband tobacco. The health board voted this week to ask Algoma municipalities to reject all motions received from tobacco companies or front groups that spike campaigns against illicit smokes with demands for a tobacco excise tax freeze or limits on regulation of tobacco products. Imperial Tobacco Canada Ltd. is a wholly-owned subsidiary of British American Tobacco Plc., one of the world’s five biggest tobacco companies with 55,000 employees in 44 factories in 41 countries. In a recently leaked internal report prepared for its London-based parent, Imperial Tobacco Canada reveals that it’s been quietly involved for years in lobbying campaigns by convenience-store and anti-contraband groups. The secret report describes Project M&M, a 2012 campaign intended to “mobilize local governments to pressure for big government action” against illicit tobacco, with demands for an excise tax freeze piggybacked on the main message. Listed as partners in Project M&M are the Canadian Convenience Store Association, the National Coalition Against Contraband Tobacco, the Ontario Chamber of Commerce, Fédération des Chambres de Commerce du Québec and the Canadian Taxpayers Federation. The leaked 32-page document includes a map identifying 10 “strategic municipalities” to be targeted in Ontario: Sault Ste. 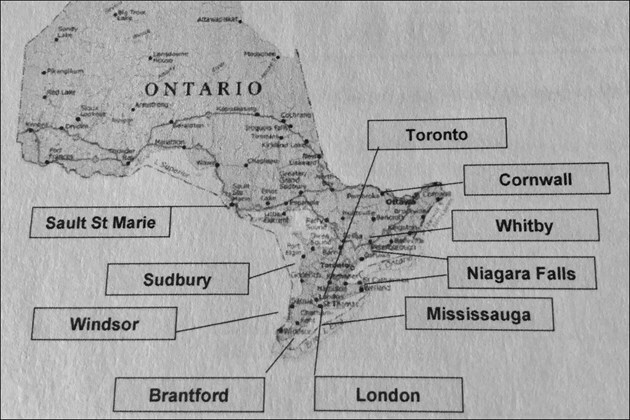 Marie, Sudbury, Windsor, Brantford, London, Mississauga, Niagara Falls, Whitby, Cornwall and Toronto. The document also identifies 10 targeted municipalities in Quebec: Montreal, Gatineau, Chateauguay, Laval, St. Georges, Sherbrooke, Quebec City, Drummondville, Trois Rivieres and Saguenay. An article published one month ago by the National Post pointed to other close ties between convenience-store organizations and the tobacco industry. “In fact, there is other evidence of their close links to the industry, including at least three former tobacco-company executives who are now leaders in the Ontario, Quebec and national convenience-store associations,” the Post’s Tom Blackwell reported. The leaked Imperial Tobacco report suggests that the “2012 lobbying campaign was no grassroots movement, and that the retail and contraband organizations have for years been used as surrogates by the cigarette giant to promote its own interests,” Blackwell wrote. Sales of illicit cigarettes are considered a major problem in Ontario, where a bag of 200 illegal “rollies” sells for as little as $10 to $15, compared to more than $80 for legally taxed smokes bought at a corner store. A 2013 study of collected cigarette butts conducted by NIRIC Group for the Ontario Convenience Store Association found that 17.7 per cent of butts picked up in Sault Ste. Marie were contraband, compared to 30.1 per cent in Kitchener, 28.5 per cent in Barrie, 24.5 per cent in Sudbury, 20.9 percent in Thunder Bay, 18.7 per cent in Toronto, 18.1 per cent in Guelph and 11 per cent in North Bay. Over the past year, governments across the globe have continued to make new agreements with the tobacco industry, as shown above. However there is a ray of hope from Namibia, which is choosing to grow more food crops. The tobacco industry is very angry that the Conference of the Parties (COP) is using Article 5.3 of the Framework Convention on Tobacco Control (FCTC) to protect the policy-making process from industry interference. The industry has hijacked the “public space” of the COP. FCTC Parties have responded in recent sessions by not allowing participation from the “public”, which is dominated by industry representatives. For COP7, FCA is recommending Parties adopt pre-screening processes for the public and for the media. (Presently, media is in the category public). The industry has gone on the offensive: conducting an international campaign to attack and discredit the COP and the World Health Organization (WHO) about lack of transparency. Industry representatives have written angry letters to both the COP and WHO and published many statements in the media criticizing the COP’s lack of ‘transparency’, which strikes a chord with broader society. The industry throws a tantrum whenever it does not get its way, and has no qualms in criticising the 180 governments that are FCTC Parties. In one statement, a representative of Japan Tobacco International (JTI) said the industry wants to see change, (read, “we want to influence the COP”), and that it needs to “keep raising our voice about these censorship practices”. Since the tobacco industry has no credibility to criticise the COP and tobacco control, it has recruited front groups, think tanks and sympathetic individuals to sing from its song sheet. The Institute of Economic Affairs (IEA) is one such close ally. It advises the industry to talk more about “due process and fairness and less about the specifics of tobacco policy in drawing attention to this issue”. Another industry funded group, the International Tax and Investment Centre (ITIC), has stepped up its efforts to protect industry interests ever since the FCTC Secretariat issued a Note Verbal in 2014 about its activities. Earlier this year, an ITIC consultant, Gary Johns, wrote to several civil society groups involved in tobacco control taking issue with the critiques they had done on the ITIC’s skewed research. In a 36-page letter he sent to the Southeast Asia Tobacco Control Alliance (SEATCA) earlier this year Johns wrote, “vested interests are not the problem – debate behind closed doors is”. The letter was riddled with false accusations against SEATCA, mischaracterizations of fact and law, disparaging comments about the WHO, the Framework Convention Secretariat and FCTC Parties. SEATCA published an open letter in response. In September, Johns, a former Australian Labor Minister, released a publication attacking WHO for not conducting its business in “transparent fashion and in public view.” The tobacco industry publicized his report in the Tobacco Reporter. ITGA’s president has also claimed that the FCTC had banned dozens of officials representing tobacco-growing countries from participating in COP7. In September, ITGA members from North and South America, India, Europe, Africa, and Indonesia were in New Delhi for a two-day seminar to prepare their protests for COP7. The ITGA claims COP decisions are being made “only by health officials and activists”. This is simply not true. Government delegations have included officials from non-health departments, such as ministries of agriculture, industry and trade, as official COP records show (Table 1). In 2008, FCTC Parties adopted Article 5.3 guidelines. They include recommendations 4.9 and 8.3, which explicitly state that Parties should not nominate any person employed by the tobacco industry, or any entity working to further the industry’s interests, to serve on delegations to COP or other FCTC meetings, nor should any representatives of state-owned tobacco industries be included on government delegations. Today, an unprecedented joint movement of leading international development and public health organisations including the British Heart Foundation, Cancer Research, Christian Aid and Save the Children, declared a major success in their campaign against the tobacco lobby. 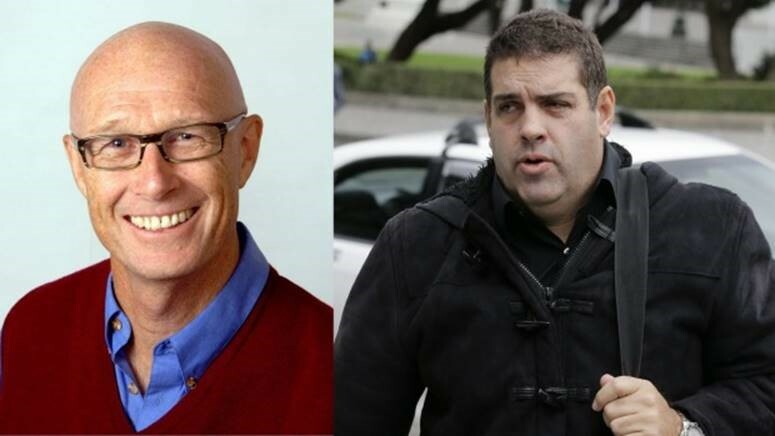 Boyd Swinburn (left) and two other health researchers are pursuing a defamation case against Cameron Slater (right) and Carrick Graham. Public health researchers worldwide have long been under attack from lobbyists for the tobacco, alcohol and junk food industries. Now some are fighting back. Adam Dudding reports. Back then, says the cardiologist and veteran public health researcher, there weren’t yet many good treatments available for heart disease, so it seemed obvious to him that he should look at prevention instead: helping people quit smoking; reducing saturated fats in the average diet. 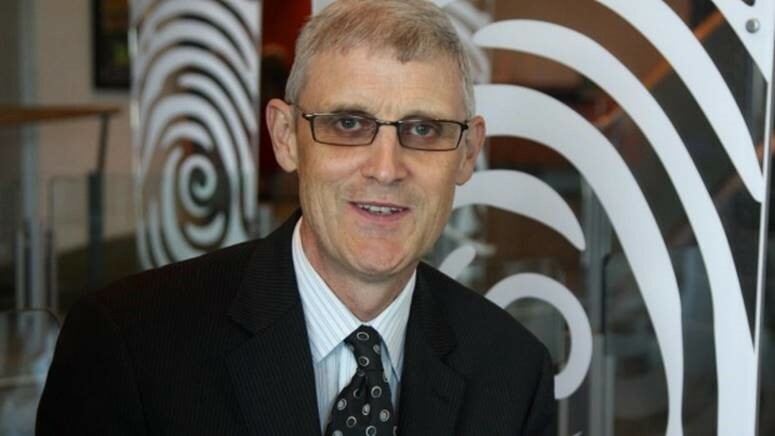 Professor Doug Sellman is an Otago university professor and director of the National Addiction Centre. To do that required changes in public understanding and government policy, so he built a career as a public health scientist, founding Action on Smoking and Health (ASH) in 1982 and later taking big jobs with the World Health Organisation. Scientific evidence led inevitably to public activism. It also led him into the firing line. The spokespeople from the tobacco industry called him and his colleagues ‘health nazis’, ‘do-gooders’, ‘nanny-staters’. He shrugged it off. 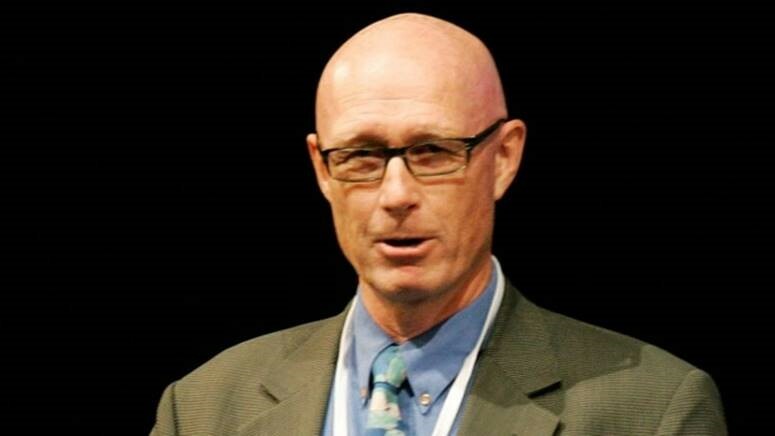 Professor Boyd Swinburn is an Auckland University professor and director of a WHO anti-obesity centre at Melbourne’s Deakin University. A few decades on, the insults are as likely to appear on an attack blog as in a press release, but the name-calling continues. But last week, a few of the targets decided to fight back. On Monday, Boyd Swinburn, Doug Sellman and Shane Bradbrook announced they were suing blogger Cameron Slater and PR consultant Carrick Graham, over material posted on Slater’s blog WhaleOil. This, almost two years after the earthquake triggered by Nicky Hager’s book Dirty Politics is a late, and surprising, aftershock. The trio – Swinburn is aN Auckland University professor and director of a WHO anti-obesity centre at Melbourne’s Deakin University; Sellman is an Otago university professor and director of the National Addiction Centre; and Bradbrook is a veteran campaigner to reduce smoking among Maori – issued a press release on Monday announcing the court action. They’re not yet talking publicly about it but it’s not hard to see what might be bothering them. For years the Whaleoil blog has described public health advocates as “troughers”, “wowsers” and “bludgers”, and ascribed their opinions to insanity, greed or delusion. Early on, some scientists were mystified as to why they were targets of Slater’s abusive criticism. It became less mysterious after the publication of Hager’s book, which used the contents of emails hacked from Slater’s computer to show the links between blogger Slater, lobbyist Graham, and industry. Sellman is a thorn in the side of alcohol manufacturers because of his public comments about the social harm of excessive drinking. Dirty Politics showed how Graham emailed Slater a post describing Sellman as “mad”, which Slater then posted under his own name. At the time Graham was paying Slater substantial fees. The clear inference drawn by Hager is that liquor industry money was, by indirect means, funding a blog that would attack not just the arguments of a scientist who spoke up against the them, but was willing to attack that scientist’s personal standing. Beaglehole had seen it all before, here and abroad. “There is a long history,” he says, “of interference by vested interests in the formulation, execution and implementation of public health policies designed to promote the health of populations. The tobacco industry has the playbook, says Beaglehole, but the food and beverage industries have learnt from them. They’re more powerful because of their size, and they’re more sophisticated. Toomath never reads the blog. She’s not suing. But just because she’s not heading for court doesn’t means she think this stuff is harmless. It seems obnoxious to even ask the question, but is Toomath a “trougher” – Slater’s charming porcine metaphor term for just about anyone who receives public funding for anything? Toomath’s charity Fight the Obesity Epidemic (FOE) received some funding under the Labour government, but it was for education and data-gathering – “there even a clause that they were not funding us for the purposes of lobbying”. Peter Griffin, manager of the Science Media Centre (SMC), says personal attacks on scientists are harmful even when they fall short of defamation. The SMC coaxes scientists into explaining and interpreting the evidence behind a news story. At the best of times “it’s really hard to get scientists to come out of their shell and talk about controversial issues, so having that kind of vicious attacking and smearing going on is a real disincentive”. Some experts that we should be hearing from “don’t even speak, because they don’t want to be a target”. This defamation case, successful or not, will “crystallise” the frustration that a lot of academics felt in the wake of Dirty Politics, when they realised that tactics that made the tobacco and alcohol industries abroad notorious were also happening, albeit on a mini scale, in New Zealand. Not all scientists like to speak out, but in fact it’s in the job description. According to the 1989 Education Act to be a university academic is to accept the role of “critic and conscience of society”. In public health especially, it’s a short step from recognising possible interventions, to testing them out, to wanting to see them implemented on a grander scale. Currently the noisiest public health conversation is around whether we should tax sugar or sugary drinks to fight obesity and tooth decay, but many older arguments are still playing out, decades after they began: plain packaging of cigarettes, marketing of junk-food to children, taxation of alcohol and cigarettes, labelling of supermarket food, sponsorship of kids’ weekend sport by burger companies. And that’s just in New Zealand. Similar issues, and similar attacks on scientists, are going on all over the world. Since May, UK researchers who receive government grants have been banned from using the results of their work to lobby for changes in laws or regulations. According to the Observer, though the aim of the new law was to prevent NGOs lobbying ministers and ministries with the government’s own money, but senior scientists have said the effect will be to muzzle scientists speaking out on important issues. Cameron Slater is bullish about his chances against his accusers. He’s been fighting a defamation case against businessman Matthew Blomfield since 2012. In early 2017, he’s due in court to defend himself against a defamation action by politician Colin Craig. In a blog posted on the day the suit was filed, he wrote that he had “become quite comfortable” with being taken to court. Last week Slater said that of the 31 causes of action made in the claim against him by the health researchers, 14 are too old to be actionable, and the remainder are mostly “hurty-feelings stuff – they’re upset about being called wowsers or bludgers or troughers”. He says the idea that his blogs have diminished the trio’s public standing are problematic, seeing they’re still regularly called by media for comment on health stories, “and they continue to publish peer-reviewed articles, so their peers obviously don’t think they’re diminished”. What this is really about, says Slater, is people in positions of power using court processes “to bully and silence critics”. He says the situation resembles the case in the US of Mark Steyn, a conservative National Review blogger who was sued in 2012 for defamation, after alleging that climate data analysis by esteemed climatologist Michael Mann temperatures was “fraudulent”. The Steyn-Mann case is still dragging on, and Slater says his case, like Steyn’s, embodies important principles. Hearing Slater’s characterisation of the clash can be like looking down the wrong end of the telescope, as he inverts the claims of his opponents. Slater is unapologetic about the abusive tone of his blog. “That’s my method … my device is to use humour, to use satire”. People might say he should lift the level of debate and engage with the issues rather than make personal attacks, but that means setting standards” for where the debate should be. 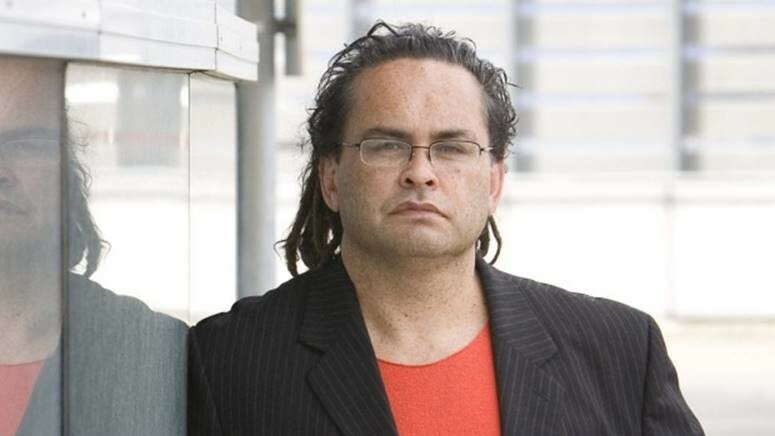 Much of the news coverage that followed the publication of Dirty Politics focused its revelations about the National government’s willingness to use people like Slater to promote its views and attack its enemies. The chapter about Slater’s attacks on scientists like Doug Sellman received rather less attention. It’s almost two years since the book was released. This lawsuit against Slater and Graham seems unlikely to reach court before next year. Hager might be disappointed that his book didn’t have the impact he expected at the time, but the reverberations aren’t over yet. When the science of public health comes under attack, “you have to stick to the evidence”, but you also need to do a bit more than that, even when it gets difficult. One of today’s biggest political forces was born in a business conference room. One of my first assignments as a consultant in early 1993—as President Bill Clinton planned his first budget submission to Congress— was to join the Citizens for a Sound Economy (CSE) leadership on a New York fund-raising trip to meet with a huge corporate partner with vast experience in building real political muscle who could help CSE reach beyond Koch oil money for their new grassroots efforts. We visited Philip Morris. As we walked into the tobacco giant’s imposing headquarters in New York, I considered whether I should tell CSE about my relentless efforts over the past three years to convince the FDA to declare jurisdiction over the tobacco industry. Philip Morris knew what I’d been up to with Commissioner David Kessler (my former boss) at the FDA. Philip Morris’s senior government affairs officials knew we’d come quite close to getting the leadership at the Department of Health and Human Services— including Secretary Louis Sullivan— interested. But there wasn’t time. We headed to one of their main conference rooms. We were met by several of Philip Morris’s state-based government affairs experts, all of whom had significant experience in building coalitions with an eye toward blocking regulations they didn’t like at the state level. The concept that CSE put on the conference table, which was quickly taken up by the Philip Morris staff, was a bit shocking to me. They proposed an unholy alliance— Philip Morris money commingled with Koch money to create anti-tax front groups in a handful of states that would battle any tax that moved. It would make no difference what kind of tax— the front groups could battle cigarette excise taxes in the Northeast and refined-oil fees at the coasts. Any tax, for any purpose, was bad— and these front groups would tackle them all, with Philip Morris and the Kochs behind them. It made good business sense— and good political sense as well. You could relabel just about anything as a tax, and heaven knows the American public hates taxes. This, at its core, was the beginning of the American Tea Party revolt against the power of the government to pay for its programs. They could recruit average citizens from a variety of ideological groups to their cause. They would work side by side with corporate-directed workers and employees, providing real boots on the ground when enough activists weren’t readily available. And no one would be the wiser—or even care— that these “grassroots” anti-tax groups would be jointly created and funded by the largest private oil company and the largest cigarette company in the world. What didn’t become public until nearly twenty years later was that these themes of a Tea Party anti-tax, anti-regulation, and anti-government revolt were then developed almost simultaneously by two of the largest tobacco companies— Philip Morris and R.J. Reynolds— under the guise of political and business coalitions to fight excise taxes of all sorts, including cigarette taxes. In successive phases in the 1990s, with the Kochs’ CSE as its core mobilization network partner, Philip Morris and RJR helped create state- based anti-tax and anti-regulation propaganda campaigns such as Get Government Off Our Back, Enough is Enough, and the Coalition Against Regressive Taxation. Before that first deal in early 1993 was wrapped up, however, more senior Philip Morris officials joined the meeting. One of them knew me and my efforts to convince the FDA to regulate the tobacco industry. He stopped the meeting and ushered us out of the room. I was never invited back into these discussions, and I knew that it was only a matter of time before my consulting contract with CSE would end. But I still had time to watch one more episode in the beginning of the transformation of CSE from an unknown hybrid advocacy think tank carrying out Charles Koch’s wishes in Washington to, years later, the much more well-known Americans for Prosperity. When President Clinton’s first budget was submitted to Congress, it contained a novel idea to tax carbon emissions— a BTU tax that Vice President Al Gore and others had been proposing as a method to start combating global climate change. When Clinton’s budget arrived in Congress, Rich Fink walked into the American Petroleum Institute with a check in hand for several million dollars. That funding, he told API’s leadership, was available if they’d match it and allow CSE to take on just the BTU issue in Clinton’s budget. API said yes, and the single- minded campaign to target the BTU tax began in earnest. CSE created the content of the relentless attack ads in media in key states, all with an eye toward demonizing the BTU tax. In the end, they only had to flip a single senator— Democratic moderate David Boren, who represented the swing vote on the Senate Finance Committee. CSE took out one full- page ad after another in Oklahoma’s daily newspapers to hang the BTU tax around Boren’s neck. It worked. Boren capitulated quickly, the BTU tax was pulled from Clinton’s first bud get, and CSE and the Kochs had their first significant victory on the new political playing fi ld they had created for themselves with help and guidance from Philip Morris and the American Petroleum Institute. Today, the “BTU tax” legend has grown to near-epic proportions among Democratic political operatives and leaders, who have essentially forgotten what actually happened (or never truly knew in the first place). The truth here is simple. Rich Fink and Charles Koch detested the concept of a BTU tax and donated considerable sums to make it toxic for anyone who came near it. In so doing, they forged a partnership and created the framework for successful action in a political realm for the first time in their lives. But the other truth— unknown for many years—is that their alliance with the tobacco industry is what truly made the emerging Koch political empire a force to be reckoned with and firmly planted the seeds of what has become the modern Tea Party movement, which will select the Republican nominee for president in 2016. Adapted from “Poison Tea: How Big Oil and Big Tobacco Invented the Tea Party and Captured the GOP,” copyright © 2016 by Jeff Nesbit. First hardcover edition published April 5, 2016, by St. Martin’s Press. All rights reserved. In previous correspondence with your anti illicit tobacco taskforce it became clear that for contraband cigarette seizures in Hong Kong approx 30-40% seized was counterfeit, meaning that 60-70% of the seizures were genuine products. This means the tobacco companies are repeatedly conspiring with their distributors to sell DNP products by failing to control their supply chain networks. Even the local tobacco front organisation HKUAIT-Stopit states that counterfeit seizures are only 40% of the total. Why is no action taken against such companies and their directors under the Organised and Serious Crimes Ordinance and for common law offences such as conspiracy to defraud HK Govt of excise taxation? In cases where criminal prosecution might be hindered such as in offending companies based in South Korea, why is no civil action raised against them by Hong Kong Government? Cigarettes containing high levels of asbestos, lead, arsenic, traces of rat poison and human excrement are flooding Ireland as dissidents and highly organised crime gangs make vast profits buying them for as little as 20c a packet. (which is more than Big T makes them for). The mark-up is huge, with a packet of 20 of what are known as ‘illegal whites’ selling on the streets for anything between €4 and €6. The illegal whites are cigarettes with fictional brand names such as Excellence, Palace, President, CK, Gin, Ling, and M&G and are being manufactured in the United Arab Emirates, China, and Eastern Europe. An operation carried out by former policemen in Cork in recent days showed the city awash with the illegal whites which were purchased from Asian, Irish, and Nigerian people. The team of four, which travelled from Britain, spent just a few hours walking around the city talking to people on the street before being able to carry out a number of purchases from different sellers, which included one shop in the city centre. The Irish Examiner accompanied the team on the operation. They were led by former Garda Detective Chief Superintendent Kevin Donohoe and ex-Metropolitan Police Detective Chief Inspector Will O’Reilly. They have been working on behalf of Philip Morris International — which manufactures such brands as Marlboro and L&M — to get a snapshot of the rapidly growing illegal market. and potentially very dangerous to people’s health (just like the real thing) . The remaining tobacco purchased was contraband — genuine brands of cigarettes and roll-your-own tobacco smuggled into the country without duty being paid. The former senior garda said Irish Customs believes the tax loss to the exchequer per year is around €250m, but Grant Thornton has put it as high as €500m. A shopkeeper was caught out selling dodgy tobacco after a sniffer dog found a secret chute behind his counter. Amir Sohail had installed the sophisticated delivery system where £10,000 of cigarettes, loose tobacco and snuff was hidden in an upstairs room. Investigators said that when an order was placed the 44-year-old would radio upstairs where the smuggled tobacco was put into a chute below the floorboards of the first floor room. It would come out of a secret hatch behind the ground floor shop counter. But his scam unravelled after trading standards officers received a tip-off and sent ‘tobacco sniffer dog’ Bertie who discovered the chute. Council trading standards officers seized 3,500 cigarettes, 2kg of tobacco and 27 packets of snuff from Sohail’s shop in Levenshulme. Manchester. They found them in an upstairs room where a piece of flooring had been removed, revealing the top of a pipe leading to the shop below. At Manchester Magistrates Court Sohail pleaded guilty to selling illicit tobacco products. Sohail had been previously prosecuted for similar offences in January 2014, when he was sentenced to a 12 month conditional discharge and ordered to pay costs of £900, plus a £15 victims of crime surcharge. Cllr Nigel Murphy, Manchester City Council’s executive member for neighbourhoods, said: “Illicit tobacco products are often sold to customers at a much lower price than their legal equivalents, making it easier for children to start smoking and become addicted to tobacco. “They are often manufactured in completely unregulated environments. “This case demonstrates the lengths that some unscrupulous traders will go to in order to disguise their criminal activities, but also that our officers will stop at nothing to find them. Dana Hamid, 34, of Littleover, pleaded guilty to each of the offences at Derby Magistrates’ Court following a successful prosecution by Derbyshire County Council. 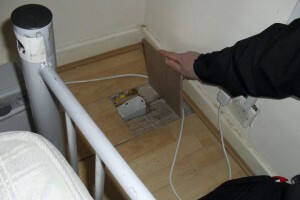 He admitted seven charges of the sale and possession of counterfeit tobacco under section 92 of the Trade Marks Act 1994 and one charge, under Regulation 8 of the General Product safety Regulations 2005, of possession for sale of cigarettes without the legally required in-built fire safety features. 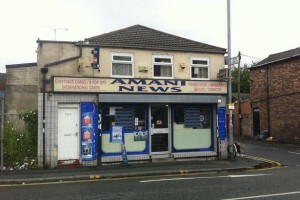 The offences took place at ‘The Sweet Shop’, in Church Street, Swadlincote, where Hamid had taken over the tenancy in November 2013. 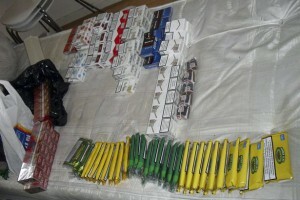 Trading standards officers seized 8,640 cigarettes and 11.3kg of hand-rolling tobacco. The fake cigarettes were being sold for around £3.50 a pack and the pouches at around £10 which would have totaled an illicit retail value of almost £4,000. Hamid was fined £500 for each of the eight offences, ordered to pay costs of £2,687 and a victim surcharge of £50.